An omlette is a great way to have a filling meal (or snack), but surprisingly not many folks make great omlettes. We think we make great omlettes. Popular fillings are ham and cheese, or finely cut vegetables. Be creative and choose your own filling. 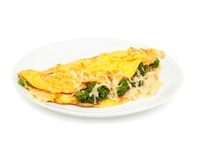 We think that the smoked fish is to die for in an omlette, but really it's your imagination that counts the most.